IS rear brake mount , A Question ! I have picked up a new bike frame and I was hoping to switch all the parts from an older bike over. However I see that the rear brake mounting on this new frame has two holes that are not threaded as opposed to the old bike which had threaded. 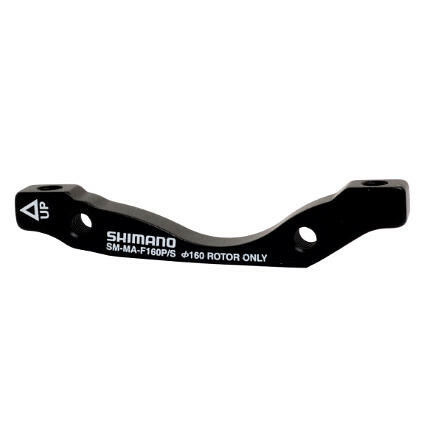 A bit of Google fu and I see that I had Shimano Post mount brake caliper adapters on my old bike but now I need a Shimano IS mount adapter that matches the 160mm rotor size. My question is this ; Are the mounting faces on the frame supposed to both lie on the same plane ? I have looked at the IS adapter part above with a view to buy it but it seems to be a flat piece whereas you can see in the photograph of the frame here that one of the mounting holes is significantly further inward than the other. Is this normal or a frame defect ? Or am I looking at the adapter the wrong way around ? Any light shedding much appreciated ! That may be a slight optical illusion. The mounts may actually be in the same plane with each other but not with the angle of the stays. Put a straight edge against the flats of the mounts to find out. In post welding and painting a decent bike company would face the mount interface , if the welding processes had resulted in distortion ..
put it all together and see how it goes in total.. the post mount on the caliper itself has adjustments..... oval holes.. I agree with the two previous posters that it can a) look like an illusion and b) you need to get it all put together and see how well you can get everything adjusted. I built up a new bike last year that used IS mounts. I had no problems at all aligning the rear caliper, but the front would rub no matter what I would do. I started to obsess over the way the mounts looked, with or without the adapter and was convinced the fork or IS mount were faulty because they didn't look like they lied on the same plane. A little internet research led me to posts suggesting it was most likely a facing issue. 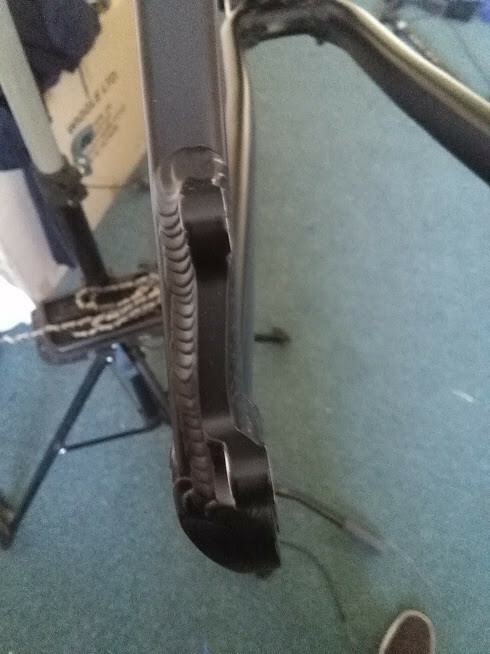 The typical advice is to "take it to the LBS", but after 6 calls (in decent sized metropolitan area) to all the local bike shops, 5 of them had no idea what I was talking about when I said I need the IS tabs faced, and the 1 shop who knew what I was referring to said they didn't have the proper tools. I found the tool I needed for about $100 (which only faces IS mounts BTW) and after facing the tabs, the caliper could be aligned with no issue at all. I don't see anything wrong with the mount. The adapter goes on the inside face of the IS mount. The mount is supposed to be in the same plane as the dropout/hub interface, not the stay. The image in the first post is a front 160mm adapter, front adapters are different to rear adapters, a rear 160mm adapter is needed. Rear IS mounts are set at 140mm, front IS mounts are set at 160mm, you can use a 160mm front adapter on the rear but you will need to decrease the rotor size by 20mm.